Translation: The box over the first chart (weight from birth to 36 months) says that it's important for the mother to keep a record of the baby's weight and it's also important that the baby's weight goes up following and stays between the curves. The box below the second and third charts (weight from birth to 60 months) says that if the weight goes up the baby is fine, if it levels the baby's health is threatened and if it goes down the baby is in serious danger. The box also says that if the weight stays inside channel A the baby is OK, if inside channel B the baby is malnourished of degree 1, if inside channel C the malnutrition is of degree 2, if inside channel D the malnutrition is severe (degree 3). 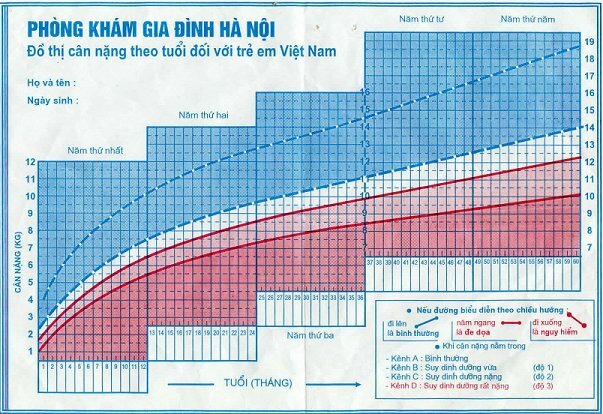 Many thanks to Tran A. Tu for translation and for Meg Lewinson and Peggy Patocasa for sharing this growth chart.